Wow what a find! This is a pristine example of the Mercedes Benz SL500 in stunning Magma Red over Black Nappa Leather and Burl Walnut Trim with only 33,000 original miles! Includes the SL2 Package with integrated CD changer, Xenon Headlamps and Heated Front Seats. MSRP of $87,305. We also have all the books, extra keys and the original window sticker. This is the one to own. We took this in trade over the winter and have completely gone over this vehicle and its 100% ready for its next new owner. Non smoker with perfect CarFax and only 2 owners since new. West coast owned but now its here for you to enjoy. Contact Hunter or Steve for an appointment to see and drive this fantastic Mercedes. Non nicer. Thanks for looking! 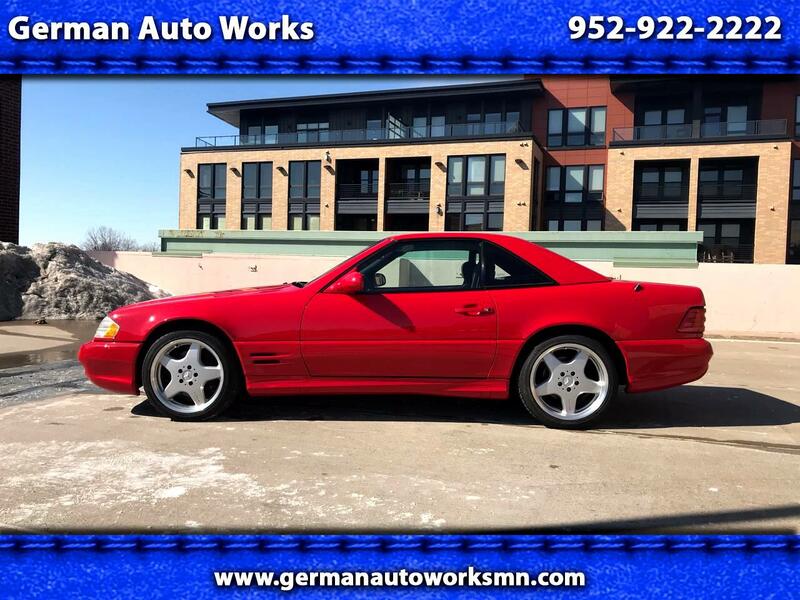 Visit German Auto Works online at www.germanautoworksmn.com to see more pictures of this vehicle or call us at 952-922-2222 today to schedule your test drive. Message: Thought you might be interested in this 2001 Mercedes-Benz SL-Class. Wow what a find! This is a pristine example of the Mercedes Benz SL500 in stunning Magma Red over Black Nappa leather and Burl Walnut trim with only 33,000 original miles! Includes the SL2 Package with integrated CD changer, Xenon Headlamps and Heated Front Seats. MSRP of $87,305. We also have all the books, extra keys and the original window sticker. This is the one to own. We took this in trade over the winter and have completely gone over this vehicle and its 100% ready for its next new owner. Non smoker with perfect CarFax and only 2 owners since new. West coast owned but now its here for you to enjoy. Contact Hunter or Steve for an appointment to see and drive this fantastic Mercedes. None nicer. Thanks for looking!